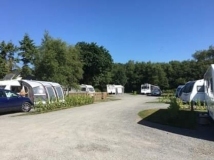 They have 9 electric hook up pitches with water and waste facilities suitable for tents / motor home / tourers and all sizes are welcome with all pitches having a lake view . There is a new shower / toilet building which is located where the pitches are situated in which they offer ladies toilets / showers and also mens toilets / showers. There is also a fully stocked tackle shop, which sells bread, milk, snacks, drinks, ice creams and much more, and if you fancy a hot drink they also have a tea & coffee station in the shop. For those needing to stay in touch there is free wifi in and outside the shop and even when the shop is closed there is still wifi outside the shop area. 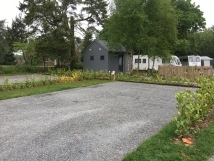 The site is open all year round and children are welcome and well behaved dogs (and dogs stay for free), and they allow a maximum of 2 dogs per pitch. The 2019 tariff is £20 for 2 people per ehu pitch per night inc electric and awnings are free of charge. For extra people staying there is a £5 charge per person per night for adults and £2.50 per child per night . Fishing tickets can be purchased from the tackle shop priced at £10 from dawn to dusk on the pleasure lakes or £15 from dawn to dusk on the specimen lakes where carp go to 31lb 2oz. If you fancy 24 hours fishing the cost is just £25 per person and they stress that pre booking is essential on the specimen lakes only. Locally there are a few pubs nearby and one of them has a courtesy mini bus who will pick you up and drop you back when you like! Why not join their regular visitors and try the site and you may feel like them and say once you have been here once you want to return again and again to escape busy life.. Win a Weeks Holiday at Stafford Moor Fishery for 4 people worth £490! We have teamed up with Stafford Moor Fishery and are giving you the chance to win a 1 week stay on a camping or touring pitch, to be used anytime during 2019, worth up to £490. The prize is for up to 4 people on a hardstanding pitch, including awning, pets and electric, plus fishing passes on any pleasure lake which are Oak, Tanners, Pines & Woodpecker Lakes. You can read independent visitor reviews of Stafford Moor Fishery here - you can also leave your own review for a chance to win £150!